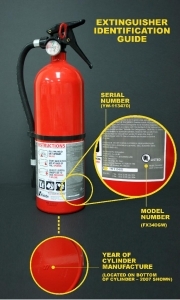 On 03-12-2009, the Consumer Product Safety Commission (CPSC) published a recall regarding the fire extinguisher on the left. This product sold new beginning in October of 2007. About 200,000 Units are involved in this recall. On 11-13-2006, the CPSC published a recall regarding the four fire extinguisher just above this paragraph. The product sold new beginning in May of 2003.